Classic Performance now offers rear suspension components for the 1963-72 Chevy Truck. Available as a complete kit or purchased separately, these parts offer a wide range of benefits and a clean custom look. Added exhaust clearance, increased ground clearance, corrected pinion angle, increased driveline clearance, additional torsional rigidity and strength are just a few of the features. CPPs tubular trailing arms are manufactured with a laser cut and formed spring platform fabricated to a CNC bent heavy wall 2 DOM tube body. The bushings are made of a NEW patented D-Spec heat resistant, self-lubricating material that offers long life and a remarkably quiet, comfortable ride. The complete kit was designed with lowered trucks in mind, correcting the pinion angle that is affected with lowered coil and air springs. The crossmember will bolt into the original location and works with factory trailing arms. This will correct pinion angle associated with a lowered truck and offer 3 by 5 exhaust openings. The Trailing Arms will bolt up as a direct replacement for the original trailing arms and can be used with the original crossmember, rear axle and coil springs. 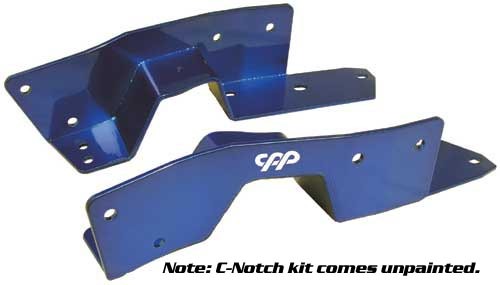 Package includes trailing arms, crossmember, C-notches, shock relocation kit, deluxe trac bar, lowering blocks, lowered shocks, axle perches, U-bolts, coil springs, and spring retainers (options include billet carrier bearing and weld-on axle perches). Works with one or two-piece drive shafts.